To become mature in our faith. To understand his word to us and to apply it to our lives. To discern the working of the Holy Spirit in our lives as he reveals truth to us. As he convicts us of our sin and points out things we need to let him change in us. 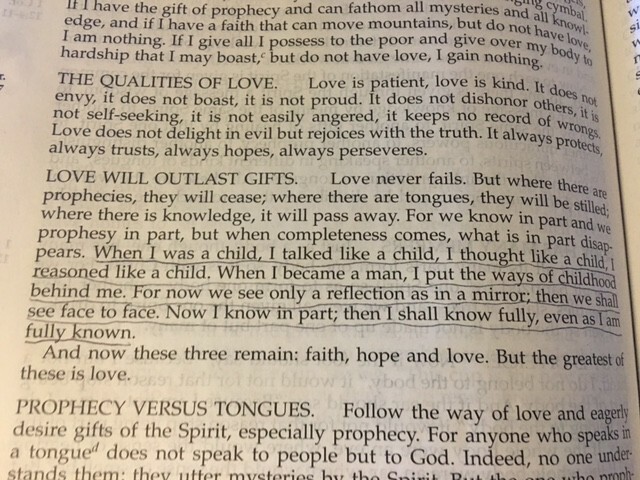 Paul tells us in 1 Corinthians 13 that, when he became a man, he stopped talking like a child, thinking like a child and reasoning like a child. Have we made the decision to grow up? To put away childish behavior and become an adult in our faith? Have we stopped making excuses for not putting God first in our lives – his first and greatest commandment? Just like Paul, we’ll never fully know God this side of heaven. But we are fully known by him. He sees any of the childish behavior left in us. He hears all of the excuses. He sees all of the time we waste on foolish things. He knows our heart…our motivations. He desires a personal, daily relationship with us anyway.